©2018 BREEZE PUBLICATIONS INC. Final paving begins on Greenville Avenue Citizens Bank campus, new exit ramps near completion JOHNSTON – With carpeting in place and furniture moving in, the Greenville Avenue Citizens Bank campus is looking ready to meet an expected mid-August opening date, said bank Executive Vice President Michael Knipper. As construction on the project nears an end, roadwork on Greenville Avenue and the new Route 295 exit ramps are coming to a close as well. Knipper said final paving on Greenville Avenue from Smokey Drive to Salina Avenue will begin Monday, June 11, and continue four or five weeks before completion. Crews will put down a 3-inch base coat and complete the road with a 2-inch top coat. "At that point, we'd finish the whole project," Knipper said. He said parking lots are paved, the pavers down, and new public recre- ation fields around the campus are beginning to take shape. 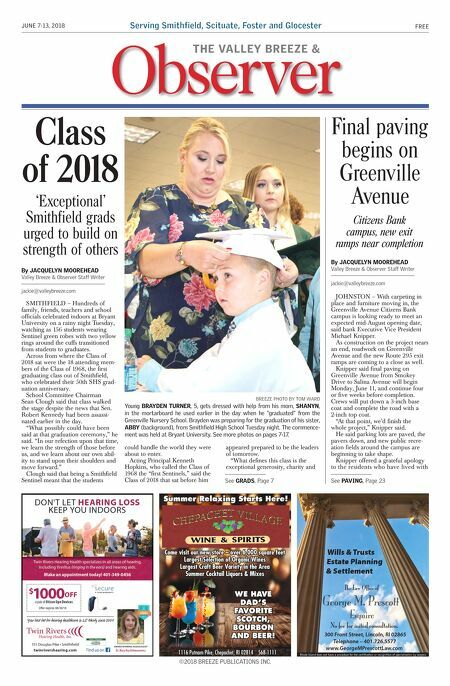 Knipper offered a grateful apology to the residents who have lived with By JACQUELYN MOOREHEAD Valley Breeze & Observer Staff Writer jackie@valleybreeze.com See PAVING, Page 23 Class of 2018 SMITHFIELD – Hundreds of family, friends, teachers and school officials celebrated indoors at Bryant University on a rainy night Tuesday, watching as 156 students wearing Sentinel green robes with two yellow rings around the cuffs transitioned from students to graduates. Across from where the Class of 2018 sat were the 18 attending mem- bers of the Class of 1968, the first graduating class out of Smithfield, who celebrated their 50th SHS grad- uation anniversary. School Committee Chairman Sean Clough said that class walked the stage despite the news that Sen. Robert Kennedy had been assassi- nated earlier in the day. "What possibly could have been said at that graduation ceremony," he said. "In our refection upon that time, we learn the strength of those before us, and we learn about our own abil- ity to stand upon their shoulders and move forward." Clough said that being a Smithfield Sentinel meant that the students 'Exceptional' Smithfield grads urged to build on strength of others By JACQUELYN MOOREHEAD Valley Breeze & Observer Staff Writer jackie@valleybreeze.com BREEZE PHOTO BY TOM WARD Young BRAYDEN TURNER, 5, gets dressed with help from his mom, SHANYN, in the mortarboard he used earlier in the day when he "graduated" from the Greenville Nursery School. Brayden was preparing for the graduation of his sister, ABBY (background), from Smithfield High School Tuesday night. The commence- ment was held at Bryant University. See more photos on pages 7-17. could handle the world they were about to enter. Acting Principal Kenneth Hopkins, who called the Class of 1968 the "first Sentinels," said the Class of 2018 that sat before him appeared prepared to be the leaders of tomorrow. "What defines this class is the exceptional generosity, charity and See GRADS, Page 7 Serving Smithfield, Scituate, Foster and Glocester FREE JUNE 7-13, 2018 Observer THE VALLEY BREEZE & Wills & Trusts Estate Planning & Settlement The Law Office of George M. Prescott Esquire Rhode Island does not have a procedure for the certification or recognition of specialization by lawyers. 300 Front Street, Lincoln, RI 02865 Telephone – 401.726.5577 www.GeorgeMPrescottLaw.com No fee for initial consultation. Offer expires 06/30/18 1116 Putnam Pike, Chepachet, RI 02814 568-1111 Summer Relaxing Starts Here! Come visit our new store – over 6,000 square feet Largest Selection of Organic Wines Largest Craft Beer Variety in the Area Summer Cocktail Liquors & Mixes WE HAVE DAD'S FAVORITE SCOTCH, BOURBON AND BEER!